We are one of the reputed and trusted manufacturer supplier and exporter of Industrial Filter Housing in Mumbai, India.Stainless Steel Air Filter Housing, Stainless Steel Filter Housing, Stainless Steel Water Filter Housing, Stainless Steel Bag Filter Housing, Stainless Steel RO Membrane Housing, Stainless Steel Housing, Stainless Steel Conical Filter Housing, Stainless Steel Membrane Housing, Stainless Steel Disc Filter Housing in Mumbai, India. Stainless Steel Multi Bag Filter effectively remove dirt,pipe scale,and other contaminants from process liquids.Quality construction and design assure clean effluent and protection for all down stream equipment. Unfiltered liquid enters the housing above the filter bags or strainer baskets,fills the interior of the housing and continues through the bag or strainer basket.Solids are trapped inside the filter bags or strainers and easily removed when the housing is serviced.Our standard O-ring seal between the baskets and the housing ensures a positive seal to prevent bypass. 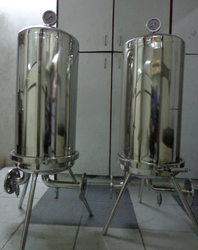 2 Two basket to 18 basket housing designs,depending upon the required surface area and volume of fluid to be filtered. 7. SUS304 or 316L strainer basket. 8. Accept #2-size filter bags. Bag filter is a new filtration system, filter bag supported within the metal basket, the liquid flows into the inlet,filtered through the bag out from the exit, impurities were intercepted in the bag, the bag after the replacementcan continue to use. The bag filters is through the filter bag, in the effects of stress, through the filter bag, be prefiltration filter bag interception down pollutants, stranded in the filter bag,filter bag phosphate contained residue stay inside, and filtrate along metal bearing a basket with netting on top wall outflow, achieve the purpose of filter. Simple operation, it just required that qualified micron filter bag be installed in the filter basket strainer, check working condition of the O shape sealing ring , then tighten the ring bolt of filter cover to start working. After pump is started, the pressure gauge will slightly rise, initial pressure is around 0.05Mpa,as the working time increases, the residue inside the filter housing will increase gradually, when pressure raches 0.4Mpa, the filter must be stopped working and operator should open the filter cover to check the residue in the bag, replaceable filter bag could be continue used (generally,washed bag filters could be repeated use). It is appropriate that filter pressure be setted at 0.1-0.3Mpa , but it could be adjusted through the return line or return valve on pump ,it is important that high working pressure will damage the filter bag and protection strainer. We are one of the leading companies in the field of the manufacturer. In provides wide range of products. 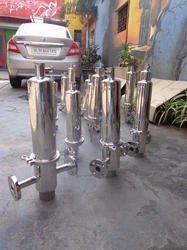 In the product range of our company we also offer these filter housing which is widely in demand in the market. 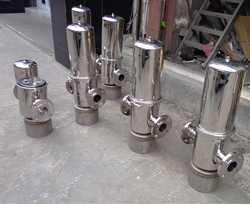 These SS Water Filter Housing are manufactured using supreme quality. These filter housings are very easy to service and safe to use. Our company providing these filters housing with different designs, shapes, and sizes or very affordable prices to our clients. Single, Multi round Cartridge, Duplex units expertly engineered for reliability and ease of use. Sure sealing covers with swing bolt closure design allows easy disassembly and faster cartridge filter replacement. 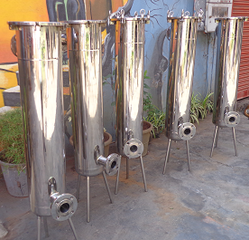 We are one of leading manufacturers and supplier of SS Filter Housing in Mumbai, India. 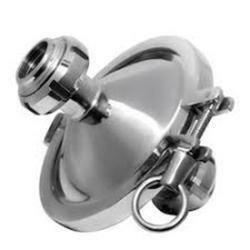 We are one of the leading manufacturer, supplier and exporter of Stainless Steel Conical Filter Housing in Mumbai, Maharashtra, India. These Inline Conical Filters are ideally suited for small volume filtration in industries and laboratories. These filters are also ideally suited for inline filtration in the product filling, washing and sealing lines of pharmaceuticals, injectables, food products, gases, instrumentation air and similar requirements which require small flows but precision filtration. Some of these filters in fact have been modified to withstand even 4500 psi rating for certain gas analysers. These Inline Conical Filters are also modified as multiporous bench filters which can be used in place of sintered glass funnels/gooch crucibles. Available in disc sizes of 47 mm and 80 mm with respective hold up volumes of 100 ml and 500 ml. 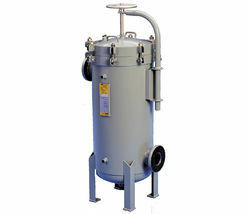 Suitable for vacuum as well as pressure filtration in laboratory scale. We are one of leading manufacturers and supplier of SS Filter Housing SS Bag Filter Housing in Mumbai, India. Looking for SS Filter Housing ?